I just joined Beauty Box 5, a subscription service that delivers a mix of five full-size and sample beauty products to your door every month for just $12! One of the things that makes it stand out from other beauty subscription boxes is that they aim to introduce customers to new brands and products--some niche, some luxury, and some even eco-friendly. I love discovering new things and thought this would be the perfect way to try some out from companies I may not have heard of otherwise. Plus, each customer receives different products so it's a surprise every time! Be a...Bombshell - lip gloss in "All Dolled Up"
Cool Way - Hydrate Shampoo + Conditioner | I use sulfate-free hair cleansers already and was happy to see that Cool Way products don't contain sulfates or harsh ingredients. However, the shampoo and conditioner didn't seem to work well with my hair type and left it feeling kind of heavy. I'll try it again and let you know if I get different results. Be a...Bombshell - Lip Gloss in "All Dolled Up" | This shade is a sheer neutral reddish pink with a little bit of shimmer. It's non-sticky and perfect for adding just a little shine. Jean Pierre Cosmetics - Oil Absorbing Tissues | I always have oil absorbing tissues in my bag because I tend to get a shiny t-zone later in the day, and I hate having to re-apply makeup. I tested these out and they work perfectly--they remove oil without messing up my make-up. The plastic case is awesome because it protects them really well too (the other ones I typically buy come in thin, cardboard packaging that can wear out easily). Model Co. - Eyeliner in Black | This pencil liner by Model Co. is a deep, matte black with a formula that's creamy and applies smoothly. The built-in sharpener is genius and ensures a fairly sharp point that can create a nice cat-eye wing. Do use it with primer though--it does smudge a little throughout the day on its own. I can't wait for the January box! Do follow along to see what I'll get next month. 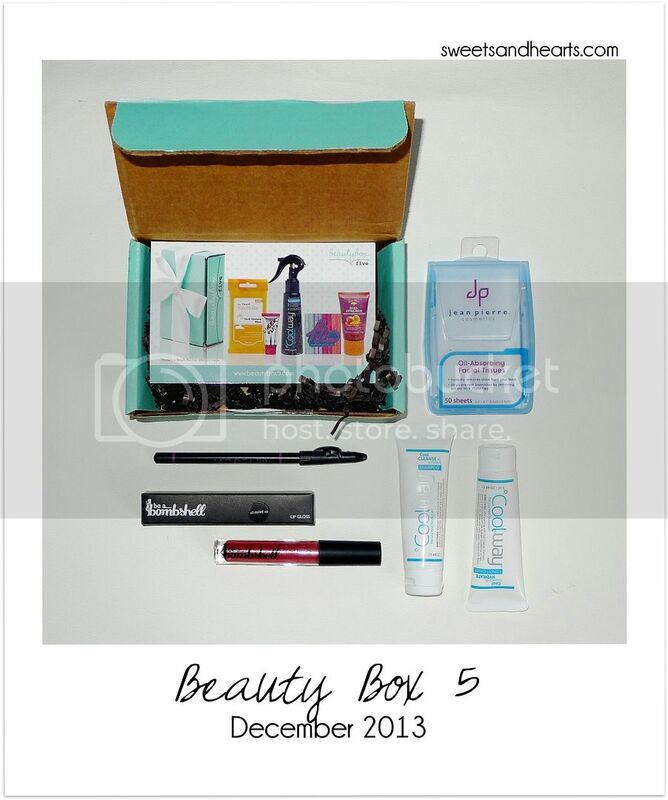 Have you tried any of these items before or are you a member of Beauty Box 5? I'd love to hear what you think!